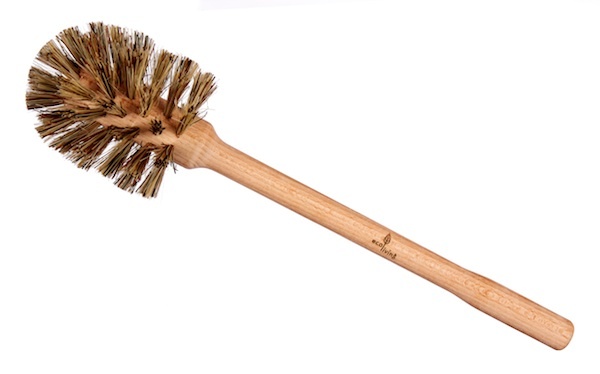 A plastic-free toilet brush, with plant-based bristles. Biodegradable and compostable, from natural renewable materials. A plastic free toilet brush, with plant-based bristles. Most toilet brushes end up in landfill or the oceans. This brush is fully biodegradable and made from vegan and sustainable materials. A toilet brush with plastic bristles can also shed hairs that can end up in the ocean, the bristles on this brush are plant-based and 100% biodegradable. A natural toilet brush with stiff Union Fibre bristles. Union Fibre, is a mixture of Tampico (from the agave cactus) and Palmyra(from the base of the leaf stalks of the India palm tree). The handle is made from locally grown beech wood. The beech wood is FSC certified in accordance with the strict guidelines of the Forest Stewardship Council. Please allow the brush to dry completely in between uses. A toilet brush and holder set is available here. Biodegradable and compostable toilet brush, from all natural renewable materials.